Many seniors need to boost their cardiovascular health. Whether they have high blood pressure or are recovering from a heart attack, diet and exercise are some of the best ways to help the heart. 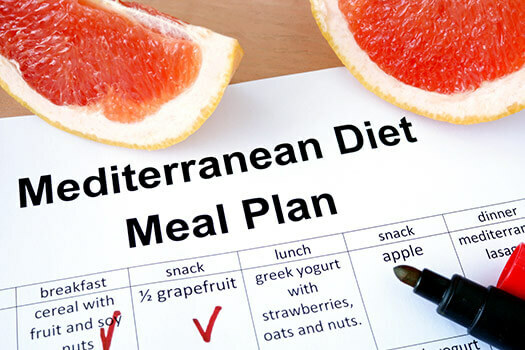 Seniors who aren’t interested in calorie counting and deprivation diets will love the Mediterranean diet, which promotes better food choices rather than intense calorie restriction. In its most basic form, the Mediterranean diet promotes the food groups eaten in the Mediterranean region, like fish, fruits, vegetables, nuts, and whole grains. Dieters swap butter for olive oil, and cut back on red meat and processed foods. This diet is great for seniors who aren’t used to calorie counting or following specific dietary plans. It allows them to dine on healthy, filling meals while also boosting their cardiovascular health. An in-home caregiver can ensure your senior loved one eats healthy meals and enjoys a higher quality of life. In Rhode Island, home care providers can benefit aging adults in a variety of ways. From cooking nutritious meals to offering timely medication reminders, the dedicated caregivers at Home Care Assistance are available to help your elderly loved one 24 hours a day, 7 days a week. Why Is the Mediterranean Diet Heart Healthy? Studies have found the Mediterranean diet is 30 percent more effective than low-fat diets at minimizing cardiovascular risk factors. This diet is so effective because it uses mono and polyunsaturated fats rather than saturated and trans fats, which can clog the arteries and increase blood pressure. Removing saturated and trans fats from the diet has an almost instantaneous effect on cardiovascular health. Mono and polyunsaturated fats, on the other hand, can be good for the cardiovascular system when consumed in moderation. These fats can lower bad cholesterol levels and increase good cholesterol levels. Encourage your loved one to switch to heart-healthy foods, and help him or her prepare nutritious meals. If your aging loved one needs occasional help with bathing, grooming, cooking, or other basic household tasks, or if you need time to attend to important personal matters, reach out to Home Care Assistance, a leading provider of live-in and respite care. Rhode Island seniors can maintain their independence while living at home with the help of our reliable respite caregivers. How Can Seniors Start Following the Mediterranean Diet? Seniors should replace butter and margarine with the least processed olive oil they can find. Olive oil can be used to sauté lean meats like fish and poultry, and it can be used as an ingredient in homemade salad dressings and to season vegetables. Because unprocessed olive oil is filled with healthy fats rather than unhealthy ones, seniors get the flavor benefits of fat without the detrimental health effects. Why Is Fish So Important? Seafood is a staple of Mediterranean cuisine. Fish is filled with omega-3 fatty acids, which are great for heart health because they lower elevated triglyceride levels. Getting a healthy dose of omega-3 fatty acids is essential for seniors for a variety of other reasons, as it also minimizes Alzheimer’s risk and relieves joint stiffness associated with arthritis. What Should Seniors Snack On? Seniors used to snacking won’t go hungry on the Mediterranean diet. They simply need to get rid of processed snacks like chips and opt for Mediterranean-approved snacks like almonds, which are full of healthy unsaturated fats. If your loved one needs encouragement to eat healthier foods, consider hiring a professional caregiver. A Rhode Island caregiver can help your elderly loved one manage his or her health in a variety of ways. If your loved one needs encouragement to exercise more often, eat healthier foods, or socialize on a regular basis, an in-home caregiver can address these and many other health-related concerns. To create a comprehensive home care plan for your loved one, give Home Care Assistance a call at (401) 284-0979 today.